Hardwood Lumber, Plywood, Moldings and Sheetgoods for all your needs! Tree Koozies – What a great idea! No, we didn’t go into the Koozie business but thought it was such a great idea for those of us in the business that we just had to share! Beautifully handcrafted Beer Koozies made right from tree branches!! Real wood and bark, no fillers or other veneer materials. Made by a local crafter in Massachusetts. These come in sizes for 12oz. cans, 12 oz bottles or 1 liter bottles. We currently have them on a trial basis and only have one of each. If you want more than one or we’ve sold out, please email us and let us know you want a “Tree koozie”! So, if you want one of these, click on the picture above to go to their website! This entry was posted in hardwood lumber on April 4, 2013 by HWagBHD. 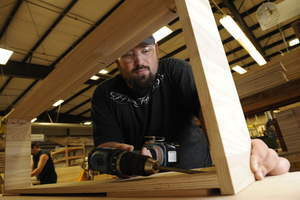 While this is a step in the right direction, we shouldn’t think that the battle is over because the same plywood manufacturers who were “dumping” their plywood products will realize that they can get around this duty by offering cut-to-size plywood which is not subject to the same regulations. So, these new regulations will shift the pain of this market inequity to the local businesses who might well be selling these plywood products as a cut-to-size product, something the Asian manufacturers didn’t have much interest in before. year asking for import relief. Chinese government subsidies given to the companies. decision on both types of duties is expected in July. Will this have any impact on supplies of logs and lumber for those of us who live in that world primarily? Maybe! Think about this. We ship a tremendous amount of logs to the Far East that go into plywood production. This is primarily in the whiter – softer hardwoods to make veneer core for plywoods but also includes some(?) 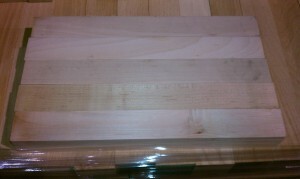 percentages of hardwoods like red oak, maple, cherry, hickory, etc., for “fancy face” plywoods. So, any of those log that are not sent to the Far East for plywood would be available here for plywood production here or even for hardwood lumber production. Other distributors have indicated that it is only China who is being penalized with a “duty” situation and that Vietnam and Malaysia have plenty of plywood producers that can absorb significant quantities of logs from the U.S. So, this may be a “shell game” and the only thing that will change will be that the “pea” is under Vietnams(?) shell instead of China’s. 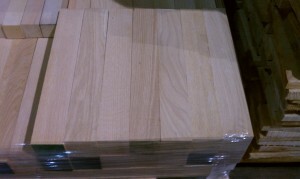 However, we do know from our own plywood suppliers that the price of plywood is going to go up right away. How much? I don’t know because some of the increases have already been factored in, in the previous three months. This entry was posted in plywood and tagged import duties, plywood, plywood grades on March 3, 2013 by HWagBHD. This entry was posted in hardwood lumber on November 19, 2012 by HWagBHD. RTA Face Frame parts are now available as chopped to length part that has a 1/2″ plywood plough milled into it. The Face Frame parts come in all the species that we sell regular face frame parts in such as poplar, red oak, hard maple, hickory and soft maple. They come in a number of standard lengths such as 14.5″, 30″, 31 1/8″, 36″ and 42″ lengths. All are molded to 13/16″ in thickness as well as to their standard widths. All are cut to length via a precision end trimmer for the consistency that you need and want. We make these parts as a way to deal with side bend and end bow in the standard mill length parts and we go to great lengths to cut any severe bow and bend out of the product. Call us today at 812-248-2233 and find out how we can make your throughput in your cabinet shop go a little faster! This entry was posted in hardwood lumber on October 31, 2012 by HWagBHD.